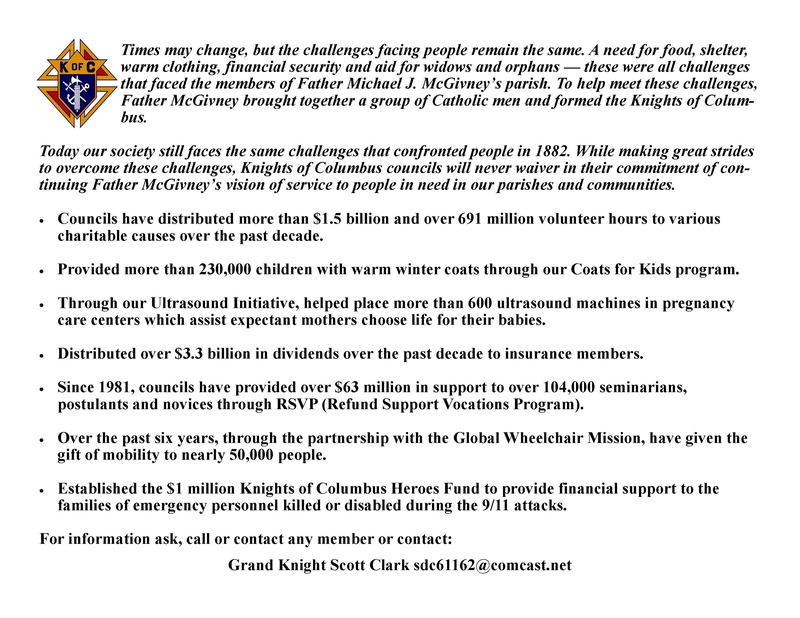 The Knights of Columbus is a Catholic Men's organization founded on the principals of Unity, Charity, Fraternity and Patriotism. This worldwide organization is dedicated to upholding the teachings of our Catholic church, helping those in need and supporting priests and religious. Local councils help those in need within their own community. We meet on the second Monday of each month at 7:00p.m in the Parish Center. The Knights invite parishioners to join them for dinner and the rosary prior to their business meetings each second Monday of the month in the Kane-Beltran Parish Center. We gather for the rosary in church at 5:30pm, dinner follows. Members are ivited to the Officer Planning Meeting on the third Monday of the month in the Media Center (upper level). Have an idea for the council? Present them at this meeting and it will be presented to the Council. to learn about things we are accomplishing, we would love to have you join this brotherhood of Catholic men. Are you a young father interested in taking care of your family should something happen to you?